We had a very special guest today...the Easter Bunny! 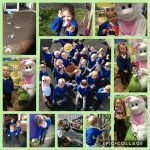 The children were very excited to meet the Easter bunny who, very generously, gave them each an egg. We also had an Easter egg hunt in our garden! 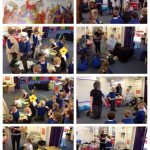 Reception loved acting out part of the Easter story with Rev'd Emma Duff from St John's Evangelist church. 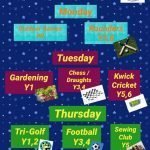 Reception – Mother’s Day treat. Reception loved celebrating Mother's Day with their family this afternoon. 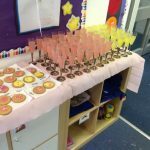 Pink fizz and biscuits. Perfect! 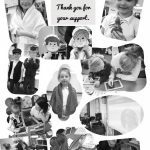 A Victorian Afternoon in Year One. 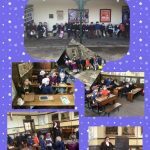 Further to our trip to Beamish parents and carers were invited into school for our open Victorian afternoon. 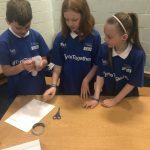 There was a range of activities for everyone to join in including making a pet doll and spinning toy, taking the interactive Victorian quiz, using the slate boards for maths and writing, dressing up in Victorian outfits, playing with old toys, creating William Morris designs, completing sorting activities and more. 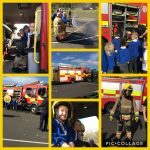 Reception have had a visit from the Wallsend fire brigade this morning. They showed us all the equipment on the truck, we got to sit in it and try the water hose. We loved it! 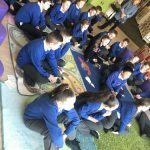 Thank you for coming in!